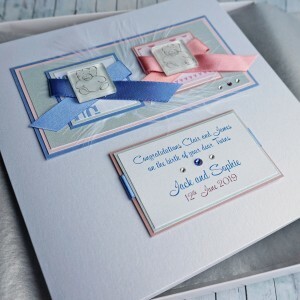 Celebrate the arrival of a new baby girl or boy with a beautiful handmade card, which can be personalised with the baby's birth date and weight and his or her name. 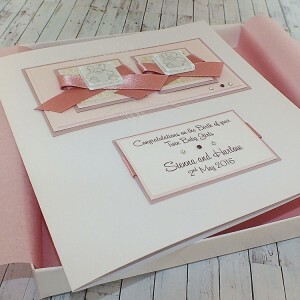 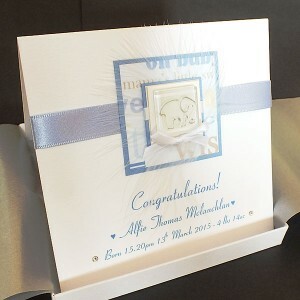 The card can also be personalised for a new mum and dad or to send to the New Baby's Grandparents. 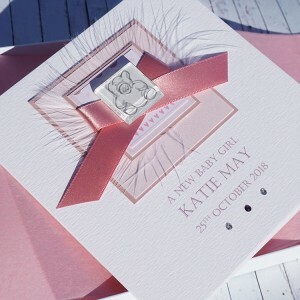 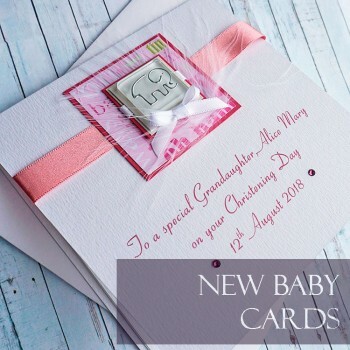 All of our baby cards can be supplied with your own choice of white envelope or a tissue lined presentation box, tied in a bow with a satin ribbon, beautiful keepsake cards that will be treasured forever. 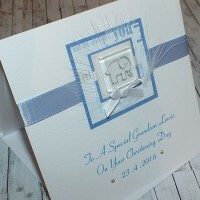 Handmade Card for a New Baby Boy - "Blue Elephant" A cute new baby card for a.. 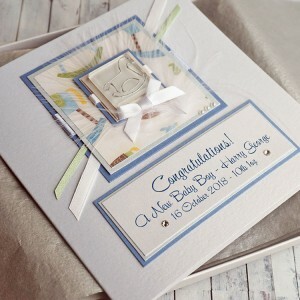 Handmade New Baby Boy Card "Rocking Horse" A beautiful personalised card to celebrate the bir..
Personalised new baby boy card.Created on a luxurious textured white card, this card features a tedd.. 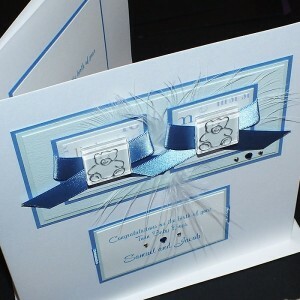 Handmade Card for Birth of Twin Boys Twin baby boys birth celebrated with two teddies hand-pa.. 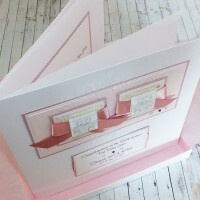 Handmade Card for Birth of Twin Girls Twin baby girls birth celebrated with two teddies hand-.. 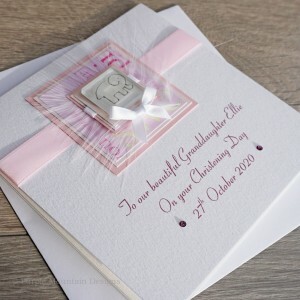 Handmade New Baby Girl Card "Rocking Horse" A beautiful personalised card to celebrate the bi..
New Baby card for a baby girl, in pink. 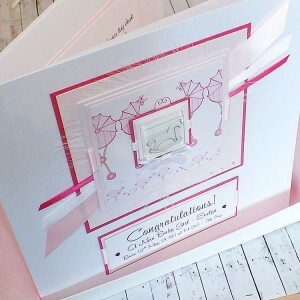 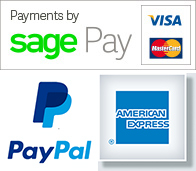 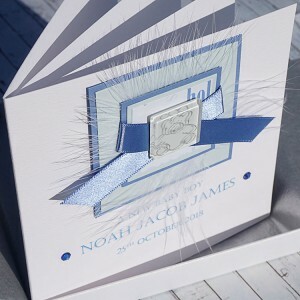 Created on a luxurious textured white card, this card .. 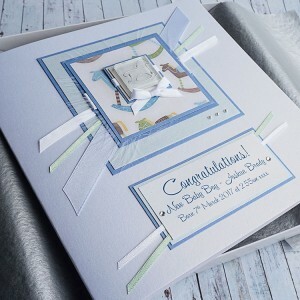 Handmade Card for Birth of Mixed Twins Twin baby boy and girl birth celebrated with two teddi..
Personalised card for new baby boy.Created on a luxurious textured white card, this card features a ..